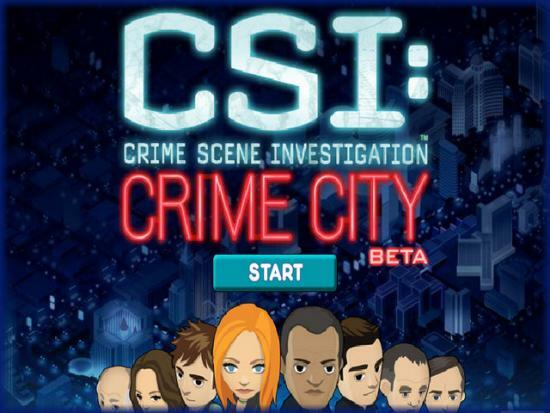 CSI: Crime City is an addictive Role Playing Game developed by UBISOFT games for Facebook. In CSI: Crime City you are a CSI Detective in Las Vegas Nevada working on homicide cases. Play along with your favorite Television show characters such as Captain Jim Brass, Catherine Willows, Dr. Langston, and many more! 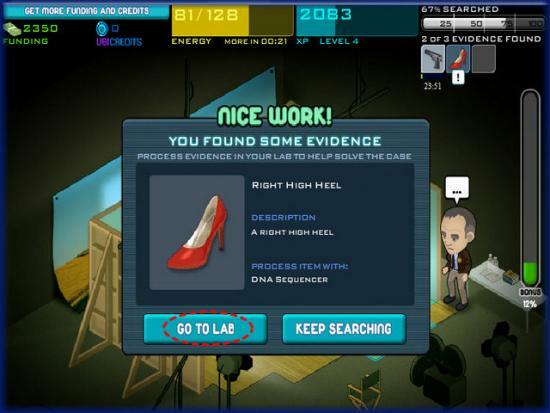 Search the scene of the crime, analyze clues in your lab, and question witnesses until you solve the case. 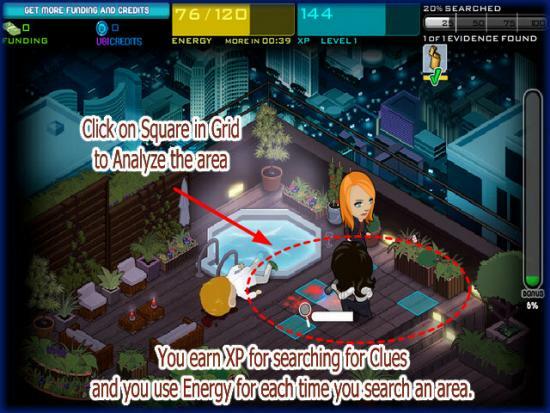 You can even play along with your Facebook friends and help each other with analyzing data and energy bonuses. 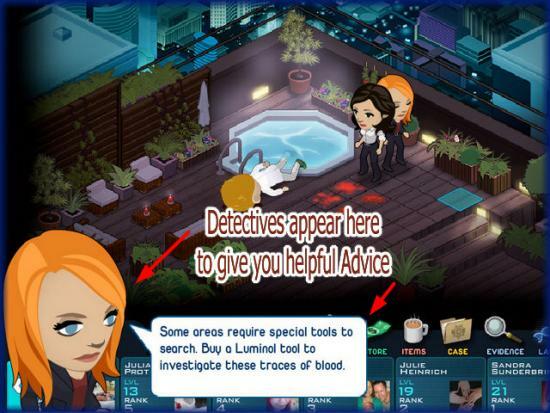 Gamezebo's CSI: Crime City strategy guide and walkthrough will provide you with a quick start guide, tips, tricks, and hints on how to win. You must have a current Facebook account to play. If you do not have one you can register for one here: http://www.facebook.com/. 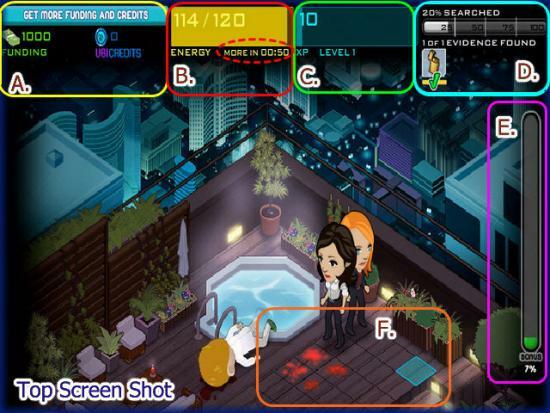 The game has a tutorial that guides you through the first case which is known as, "Sweet Revenge"
Note: The game does not have a full screen mode at this time so the images are divided showing the top of the screen in the first image and the bottom of the screen in the second image. B. Energy Meter - This is your energy meter which shows how much you have at any given time. The maximum will change as you level up in the game giving you higher amounts. There is also a countdown clock which shows how much time until you earn 1 energy credit. C. XP/Level Indicator - This is your XP (Experience Points) and Level indicator. 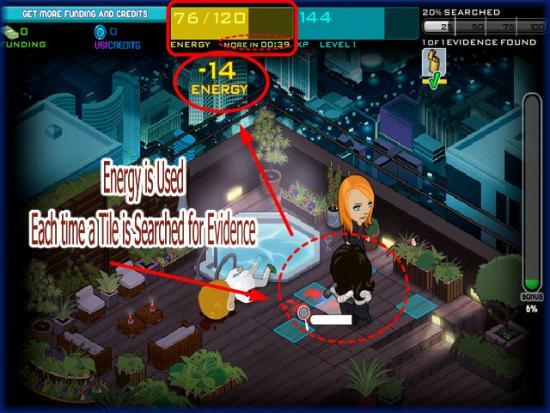 You will see your level (Also your CSI Detective Level) as well as how many XP you have. XP are what help you to reach the next level in the game. You earn XP each time you search an area of a crime scene for clues and when you purchase items to use in the game. D. Milestone Indicator - Each Case has 4 Milestones you need to reach. Each time you reach a milestone it is because you have earned a certain number of XP and searched a certain percentage of the crime scene. Look here to see how close you are to finishing an investigation. 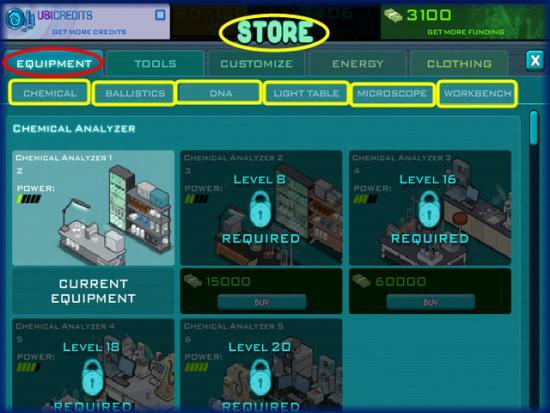 You will also see any item that is being analyzed in the lab under the Milestone indicator with a small meter under it. When the item is ready for you to look at there will be a green check mark under it. Just click on it or the lab to see the report. NOTE - You will see blank squares here when you first start a new crime scene and this will show you how many pieces of evidence you are looking for. E. Bonus Bar - This meter fills up as you earn bonus items and acts as a multiplier for XP each time you find a piece of evidence or search a trace tile. This bar will also go down over time so if you are waiting for energy to build up the Bonus bar will go down. F. Crime Scene Grid - This is a crime scene grid. 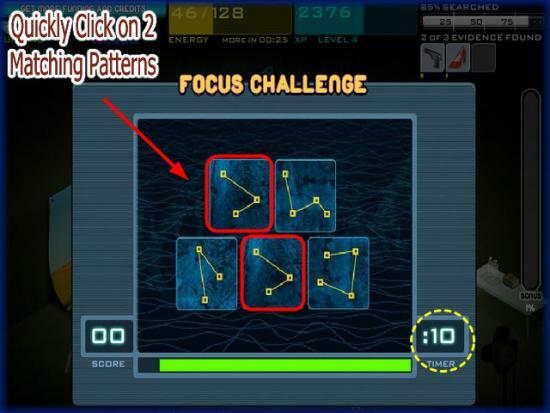 You will be able to click on each square to analyze for clues and evidence. You may need a camera, Luminol, Fingerprint kit and other tools which the game will let you know. You will not be able to proceed until you purchase the correct tools you need. Click on a square to search it. 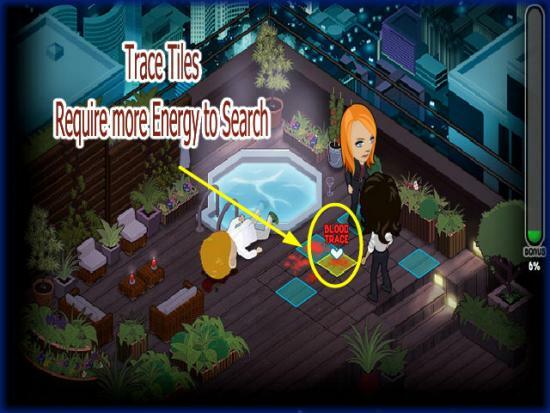 G. Your on the Scene Tools - These are the tools that you own to search Trace Tiles. These tools will need to be upgraded as you level up. 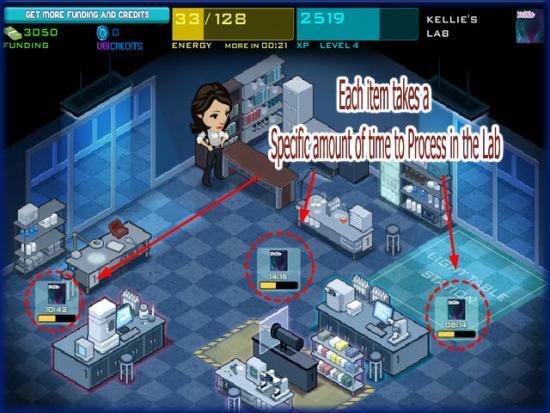 H. Game Navigation Menu - Here you can navigate around the game screens to reach the lab, crime scene, case files, HQ, Store, and to see gathered Evidence. I. 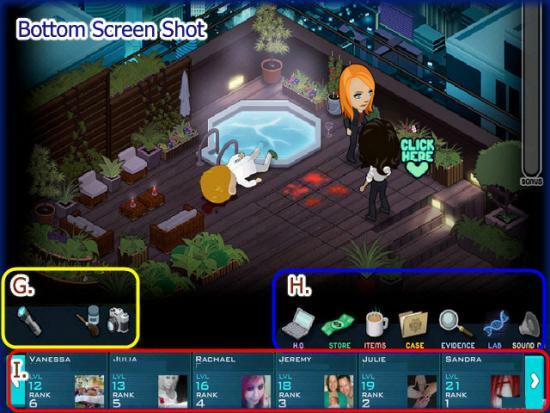 Neighbor Area - Along the bottom of the game screen you will see people from your friend list that are also playing CSI: Crime City. Click on their image to visit their Crime lab if you need to use one of their machines. CSI Funding - This is the cash you earn when you obtain a funding bonus when searching for clues at a crime scene. Most items can be purchased with CSI Funding Cash. 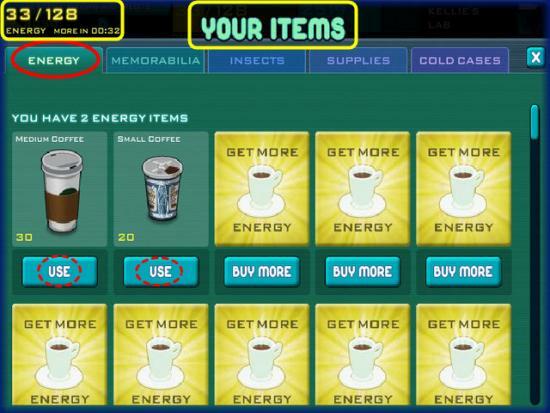 UBI Credits - UBI Credits are a secondary currency used to purchase higher end premium items in the game and also to decrease the amount of time for items to process in the lab or to purchase large amounts of Coffee to fill the energy meter which will allow you to power through the game faster without having to wait for the energy meter to refill. 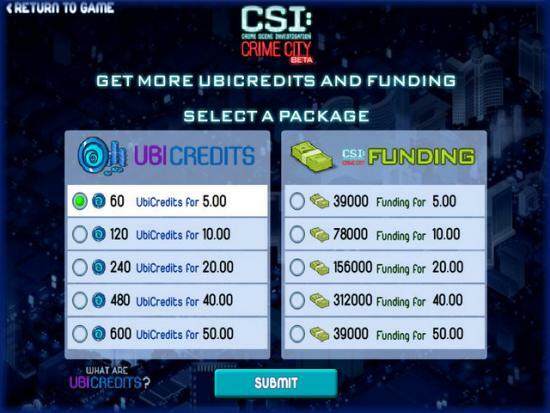 Note: UBI Credits must be purchased with a major credit card and range in price from 5 to 50 dollars in bundles. The currency can be used across the board on all UBISOFT Games on Facebook and the open Web. 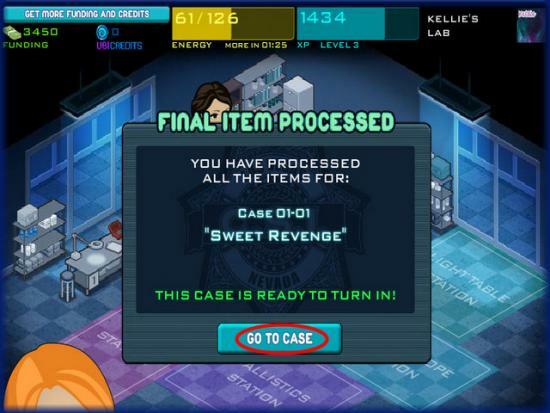 As you start to work on a case you will see the detectives at the bottom of the screen with a text bubble. If you see a "!" above a character, click on it to bring up the text bubble. Click on the bubble itself to go through the text. 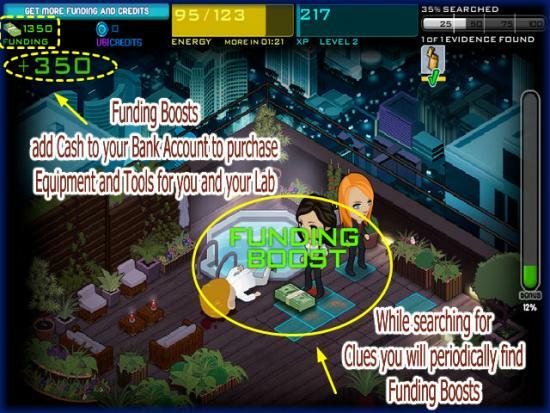 Funding Boosts - These give you additional bonus money to spend on equipment and tools. 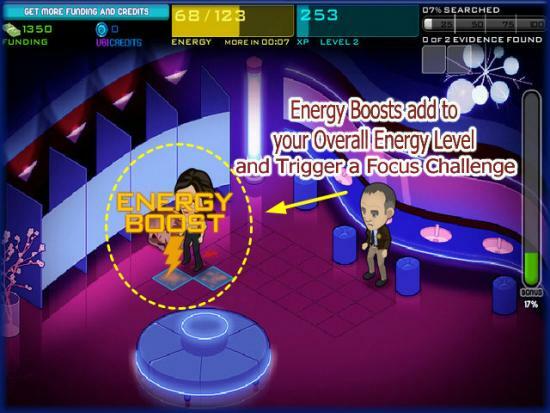 Energy Boosts - These add energy to your energy meter and also trigger the Focus Challenges which allow you to play a mini game for free coffee. 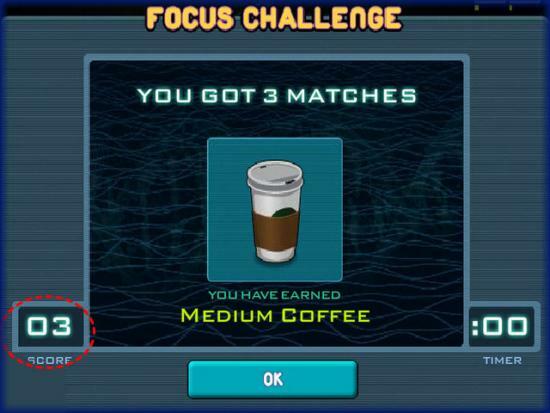 (See Focus Challenges below for more information. 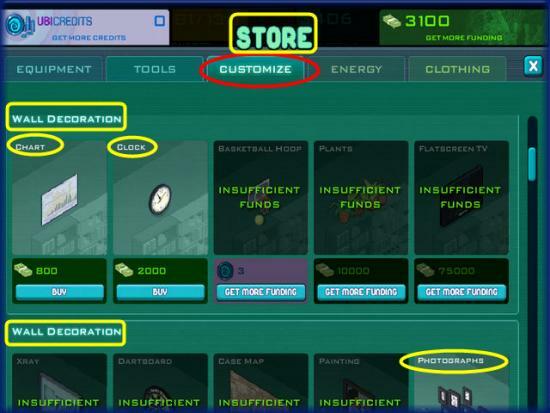 You may be prompted to purchase right then and there or you can click on "Store" and then click on "Equipment" and purchase the item from the CSI Store. If you can't afford the equipment yet then try to find a Neighbor that has it unlocked so you can use it. Note: Some of the categories in the game are marked "Coming Soon" when you click on them. Be sure to check frequently for game upgrades. You can also purchase items that are simply for decor purposes by clicking on the "Customize" tab in the store and then scrolling down to find all kinds of items such as carpet, clocks, lamps, and other decor items. It is best to purchase these items once you have a few cases solved and have some money saved. Here you can use their equipment to analyze data in their "Guest Slots" if you can't yet afford the machine you need to do the job. This will earn you both a bonus and will speed up the time it takes for you to solve a case. 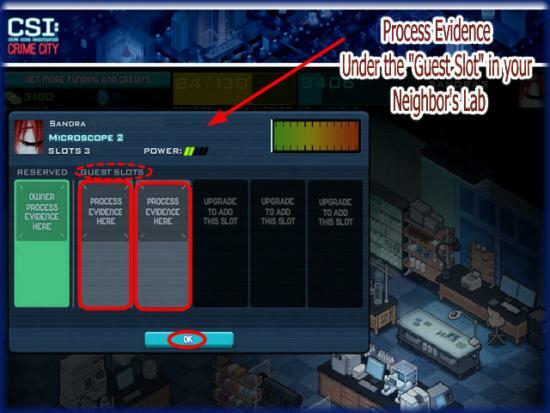 To use your Neighbor's machines click on the one you need and then click on "Guest Spot" You will have to wait the amount of time it takes to analyze the evidence. Each time you upgrade one of your machines you increase the number of guest slots in it for your Neighbor's to use. 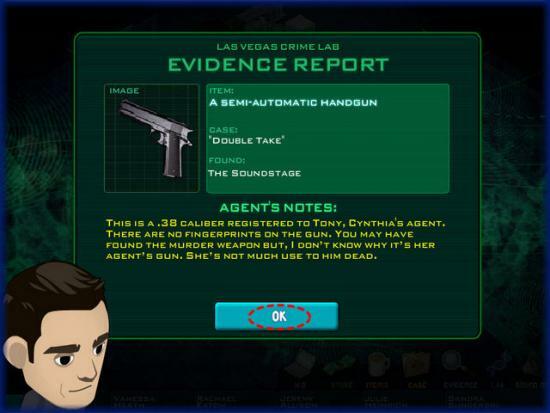 Once you have found every piece of evidence in each crime scene and have had it processed in the lab you can click on "Complete Case" button in the case file folder which will take you to the resolution screen and you will see how the case has been solved and what sentence was given to the guilty parties. 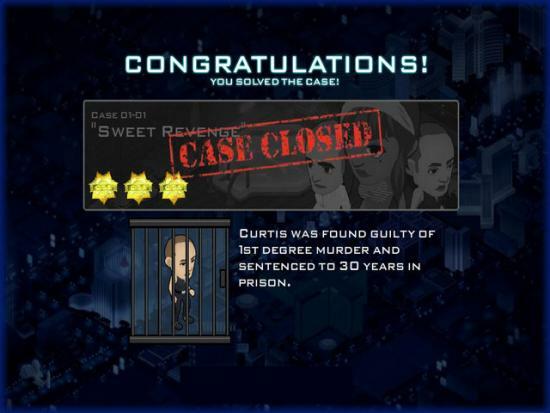 You have completed the basic game play guide for CSI: Crime City by UBISoft Games at Facebook. Be sure to check back often for game updates, Staff and user reviews, user tips, forum comments and much more. This article originally appeared on Gamezebo.